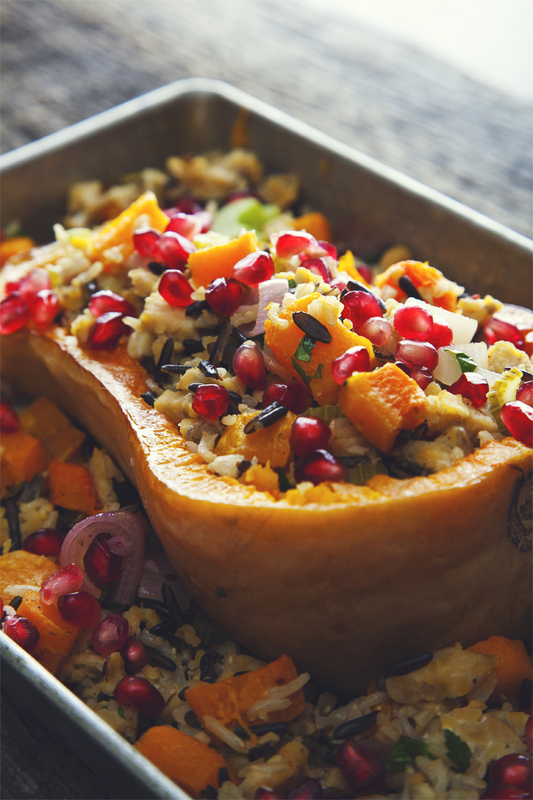 This simple Stuffed Butternut Squash with Tempeh is healthy comfort food at its best! Flavorful, satisfying, and it also happens to be a very pretty dish thanks to all of the colors and textures. I can still vividly remember perusing my favorite local bookstore a few years ago and coming across the Clean Food and Clean Start cookbooks by Terry Walters. I initially picked them up because I was drawn to their simple, thoughtful design aesthetic, and as I flipped through the pages, I thought: this is totally my kind of food. Clean Food and Clean Start both have permanent places on my small kitchen cookbook shelf. 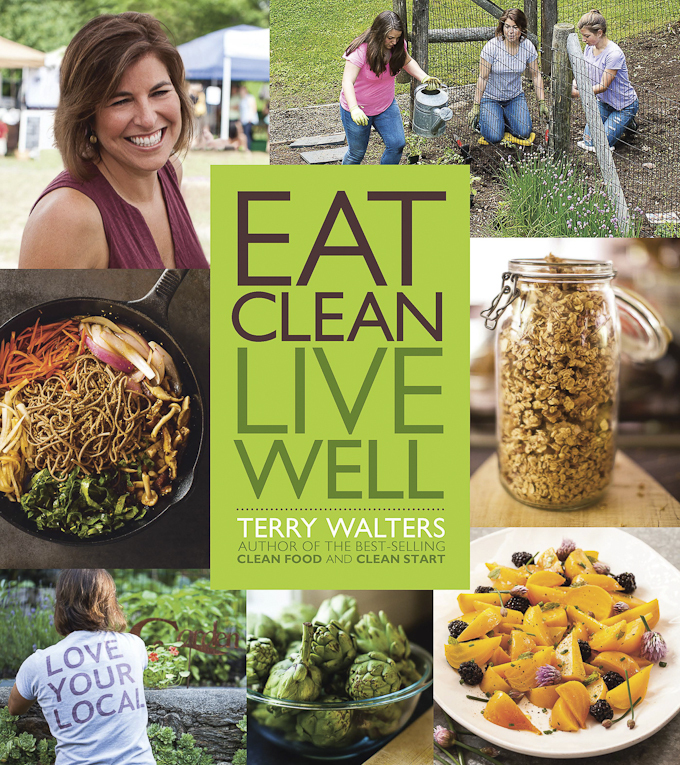 When I found out Terry was publishing a third book, Eat Clean Live Well, I knew I needed to add it to my collection. Similar to her previous works, Eat Clean Live Well is a continuation of simple, whole foods recipes divided into sections according to season, and with an emphasis on eating local. I love that Terry kept the same minimalist layout as her other cookbooks, and I especially appreciate that not only are all 175 vegan and gluten-free recipes organized into categories for Spring, Summer, Fall, and Winter (making it very easy to find meals that utilize in-season produce and fit the current weather), but Terry also begins each section with “Clean Living” advice—moving outside and Farmer’s Markets in Spring, vitamin D and the sun in Summer, fostering a strong immune system in Fall, and self care and planting seeds in Winter, among others. This is more than a cookbook. Naturally, I had a difficult time deciding which recipe to share with you. However, because I’m still solidly rooted in a butternut squash phase after learning how to quickly peel and cut one, the Stuffed Butternut Squash with Tempeh seemed like an excellent choice. 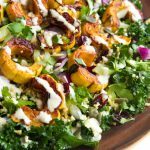 Like all of the recipes in Eat Clean Live Well, this one has a simple and nourishing ingredient list, yet manages to be packed with flavor (one of the many benefits of eating in-season!). It also happens to be a very pretty dish that would make a deliciously satisfying addition to your Thanksgiving table. Place the wild and basmati rice in pot or rice cooker with water or stock and a pinch of sea salt. Bring to boil, reduce the heat and simmer covered until the liquid is absorbed (about 45 minutes). Remove from the heat and set aside. Cut the squash lengthwise so that you have one piece that is more than half (about two-thirds) and the other about one-third. Scoop out and discard seeds, and rub the larger piece with 1⁄2 teaspoon of olive oil. Place flesh-side down on prepared baking sheet. Peel the other piece and cut it into 1⁄2-inch cubes. Place the cubes in a bowl, toss with 1 tablespoon of olive oil and spread in a single layer on the second baking sheet. Roast both for 35 minutes, or until tender. Remove from the oven and set aside. In a cast iron skillet over medium heat, sauté the shallots and garlic in the remaining 1 tablespoon of olive oil until soft (about 2 minutes). Add the celery and sauté for 2 minutes longer. Crumble the tempeh and add it to the pan. In a bowl, combine the lemon juice and maple syrup and pour over the tempeh. Fold to combine and continue sautéing to heat through. Fluff the grain and add it to the tempeh mixture. Fold in the pepper flakes, cubed squash and parsley. Scoop out the roasted squash leaving 1⁄2-inch of squash plus the shell. 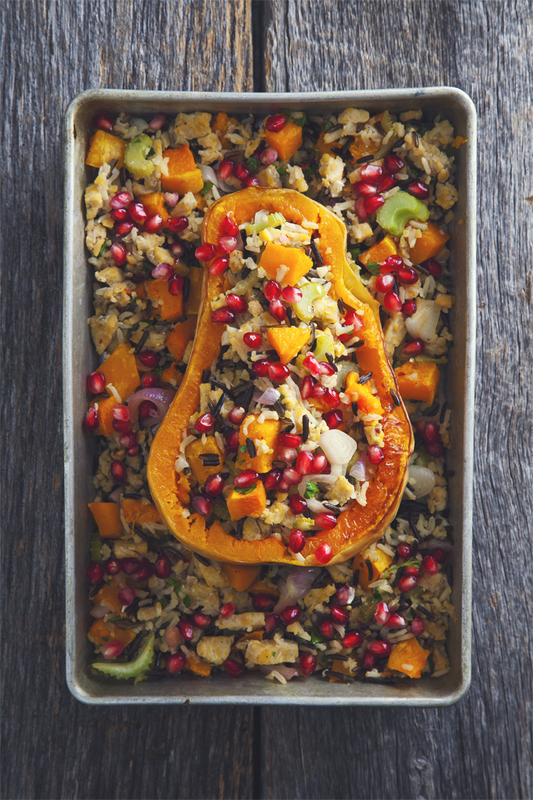 Fill the squash with the stuffing, allowing it to overflow generously. Top with pomegranate seeds, slice into 4 equal portions, and serve. Recipe reprinted by arrangement with Sterling Epicure, an imprint of Sterling Publishing Co., Inc. Copyright © 2104 Terry Walters. Book cover photo by Julie Bidwell, all other photography by Aaron Scott. Filed Under: Main Meals, Winter Holidays COPYRIGHT © 2019 Amanda Maguire. All Rights Reserved. This looks amazing! 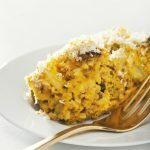 Butternut is my favorite squash and I am always happy to find delicious-looking recipes with tempeh in them since I never know what to do with it! Could you tell me please what tempeh is? I’ve never heard of it before. Thanks! You can find it near the tofu in the refrigerated section of your grocery store (even places like Walmart should sell it!). I hope you’ll give it a try! I LOVE Terry’s books! I pretty much cook from them exclusively. So simple and flavorful! I haven’t decided what recipe exactly I’ll be making this Thanksgiving, as the only vegan/gluten free person there I have to bring something that makes a meal for me! This could be a contender!! Looks amazing! 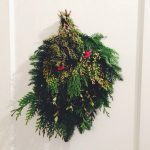 My homemade gluten-free vegan stuffing! Always a must! Oh yum! This is totally my sort of meal – love all the ingredients. Definitely roasted maple brussels sprouts and sweet potatoes! 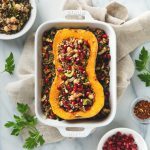 This stuffed butternut squash looks seriously incredible.. such a great idea to use wild rice in it! Even though we don’t celebrate thanksgiving here in Australia, I still will be making some thanksgiving inspired recipes such as a yummy turkey roasts and brussels sprout salad – anything for a celebration! The stuffing from my childhood, but veganized! Sweet potato mash and cranberry sauce among many others. My Portobello wellington always makes an appearance because it’s always requested by someone! I love mashed root vegetables like sweet potatoes, carrots, and parsnips! This looks so delicious!! I have never read her books before but I will totally love to get my hands on these gorgeous books packed with such delicious recipes! I am going to make wild rice with roasted brussel sprouts and dried cranberries. Yum! 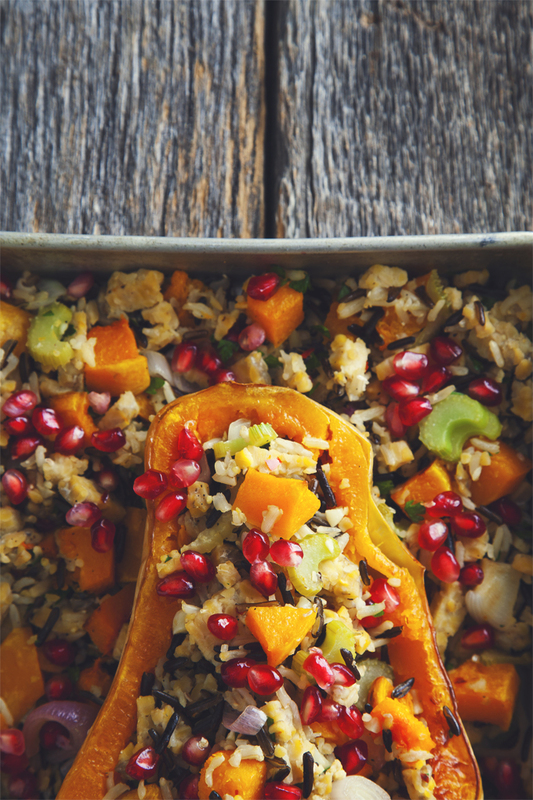 This recipe looks amazing, and I love both butternut squah and tempeh. I am also writing because I saw your article on cooking with coconut milk on yahoo. Great going Amanda! Congratulations! Hello , i was just wondering, i have never used tempeh before and i will attempt to make this vegan recipe for 2 people that are vegan and attending my thanksgiving diner. what form does tempeh come in, like tofu and i cut it in cubes ?? Hi Kelsea! You can find tempeh in the refrigerated section next to the tofu. It comes in a block that’s maybe 1/2 inch thick and you can cut it into cubes. I hope this helps! Vegan mashed potatoes because I’m hosting this year! I don’t usually get to have the mashed potatoes at others’ houses but this year I will make sure I can. Any good recipe suggestions out there? what a wonderful find … have enjoyed looking through your blog, will be bookmarking it for further reads! I love how festive this looks! I’ll have to keep it in mind for Christmas! I really want to try this but go a non-vegetarian route and add some chicken into the mix here! Thank you so much for the beautiful post about this and all of my books! To all…Eat Clean Live Well! Terry Walter’s books should be mandatory to read! Eating clean food change you forever. Oh She Glows’ Lentil Loaf. I made it a couple years ago for our family’s Thanksgiving and my Mom now asks me to make it every year now because it’s so delicious! Looks deeeeelicious!!! I don’t know if i can try this for thanksgiving since i’m travelling & visiting someone out of state, but i’ll definitely want to try this afterwards! I love making roasted acorn squash for the holidays. This looks awesome though and may need to be tried this year! Stuffed squash is walkways on my Thanksgiving table. It’s beautiful and delicious. I’m actually going to a slightly less traditional Thanksgiving dinner this year, so my dishes are more up in the air and I haven’t planned it out yet. But whatever I make will for sure involve sweet potatoes and/or butternut squash. Good luck, Amber! Sounds delicious! i don’t do anything special for thanksgiving so probably just my usual salad, grilled veggies and homemade bread – simple food that i’m grateful for everyday i can have it. I think that’s a really wonderful perspective. Cornbread dressing with pecans and sage will definitely make an appearance on Thanksgiving! I make bourbon-maple glazed sweet potatoes with pecan streusel topping that my family loves. And no one minds that it’s vegan! Thanks for the giveaway and the lovely recipe. I love squash and pomegrante together! It is the ultimate fall combo. Looks delish! This recipe is so beautiful and inspiring!! WE are definitely going to try it out using our tempeh line, and have shared it on our social medias:) Thanks! That’s so awesome, Sarah! Thanks for sharing!